I first wrote this post in February of 2013. I have had numerous requests for a reprise of the original post. My DSR is a small room with wooden shelves all around the periphery of the room, and a locking closet. You would think that having gone from a single emergency supply shelf in my first apartment, to an entire closet in the next house, to a large walk in closet for supplies in the suburban house before, that I would know what I am doing by now, in terms of design and set up. In 2005 when we finally moved our emergency supplies into this new DSR, we ran out of space very quickly. My original vision had been the locking closet for peroxide, and alcohol at the bottom, and over the counter (OTC) meds on the shelves above. I planned to put evacuation kits, evacuation bedding, and other supplies on the shelves in the periphery of the room to be grabbed easily. Then, I added a place for preparedness books. Afterward, I added a place for the Evacuation Notebooks, including medical evacuation notebooks etc.. After that, I added a place for communications equipment and it was full. There was nowhere for bottled water, freeze dried or canned food. With a large family there are lots of DSR needs. I decided to keep the room set up as is, and to buy three of the very sturdy shelving units sold at Sam's Club which have wheels. This allowed me to cluster them, and move them when I need to create an aisle through which to walk when I need something. Now I have freeze dried food, some water, toiletries, and I keep some unopened veterinary oral meds there for our farm animals. The idea behind the Disaster Supply Room is that in an emergency, anyone could enter, obtain the emergency item they need, and then use it. It is therefore very important that it be orderly and preferable that it be inventoried, and the stock regularly rotated. In August of 2011, we had a 5.8 or 5.9 earthquake, depending upon which authority you ask, which was centered not too far from here. Houses broke in half, two schools, a middle school and a high school were eventually demolished as a result of the damage they sustained that day. Many houses were reduced to being worth only their land value, when the foundations were irreparably damaged. Historical properties lost chimneys as if they were legos. We were fairly lucky in that we had less damage than most people. We built this home using a full basement with thick and tall walls made by Superior Walls. This and a fair measure of good luck limited the damage we had. We had no real damage to the house itself, although the well had slightly muddy water for a couple of weeks. However, the pantry in the kitchen did throw contents to the other side of the room. (I apparently left the door unlatched that day) A large sealed plastic bucket of ketchup which came from Sam's Club which I use to add a half a cup of ketchup to a large meatloaf on occasion, fell from the top of the frij, rupturing leaving abundant ketchup far and wide. It looked like a crime scene ! This took time to clean up, but we were thrilled that the farm and it's outbuildings did not sustain more damage. I also lost an antique piece of cloisonne as it fell from the mantle. 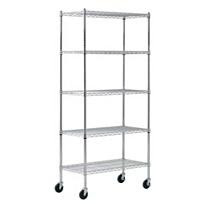 I have multiple steel shelf units such as these which are filled and stacked against each other. They can be pulled out sideways to remove or to load things we need. There is an incredible amount of space in such a set up. Sam's Club also sells longer units than this, and some that do not have wheels for heavier articles. About this time, I was aware that things had fallen from some of the shelves in the DSR. I was concerned about a lot of other things, and so I resolved to get back there later. I have used some things from there since that time, but things here have been busy. Since the earthquake, we have built an additional animal storage building on the farm, so that everything animal can be in one space. I wrote two books, and we helped our daughter locate and clean up a home she bought as a government repossession. Let's face it. I didn't really want to go through everything which had fallen down in some of the areas of the DSR. This week I finally got to it. I started by picking up all the things which had fallen on the floor from the Sam's Club metal shelves. I found bottles of Apinol. I found bottles of liquid soap. I found a large package of Omeprazole. I found a six pack of D-Mannose. A couple of hours later I realized what I had suspected originally, which is that although the heavier items remained secure on the built in shelves in the periphery of the room, the tall stainless steel shelves with wheels shook during the quake and many light items, packaged gauge, vinyl gloves, and all the aforementioned articles fell and rolled.to many different places in the room. The only reason things didn't get destroyed, is that there was relatively little activity in that room, and therefore no one to inadvertently step on them. In fact, until I got the room reorganized and the set up repaired, I have been stacking other large cans of freeze dried food elsewhere. The reason I wanted to relate this to all of you is that there is some learning that all of us can do here, myself very much included. 1. To prevent things from shaking and falling from these tall steel wheeled shelving systems a la Sam's Club, if you have them, simply buy whatever color and brand bungee cords you like. On each shelf, front and back, select the size that will hold things securely when there is shaking, or even simple normal moving. Simply hook a bungee on each side to provide a stretched guide which prevents bottles and other items from falling forward off the shelf in the front. Do the same to the back. These are simply unhooked if needed, and most times, they can remain intact when I collect something from the shelf. 2. 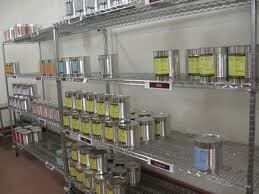 Try to stock more freeze dried food than canned. The canned food does age and need to be used within 5-10 years and some of the freeze dried really is good for 25-30 years. Also canned food is being made with thinner cans, and some of these items I would not trust as long as 5-10 years. Freeze dried food is also a lot lighter and so long as you have access to water when it's time to reconstitute all of it, freeze dried food is MUCH LIGHTER than canned when stored. This has all sorts of benefits, including when it's time to rotate stock. 3. Place smaller medical supplies like wrapped roller gauze and elastic bandages in square plastic open topped baskets. This way, fewer things tumble out when you take one. 4. Make liberal use of freezer bags. Many of these things store much better in freezer bags than they do in the boxes in which you bought them. They also occupy less space. I have fifty pairs of all different types of shoe laces, all in a freezer bag which takes up next to no space. 5. Group like things together. This sounds obvious, but it doesn't always work in the manner in which you initially cluster. I tried grouping all oral meds together, and all topical meds together. What I found is that it worked far better to group things in like categories. For example, I now have a shelf for everything related to cold and flu. This includes oral meds, and vitamin C, along with things like vaseline and Vick's vapo-rub generic. In the old system, vaseline and Vick's would have been groups separately with topical medications, leaving someone searching through several different DSR regions, paper, topical, and in the closet for OTC meds.. Now, everything from masks, kleenex with lotion, etc. are all grouped together for the ease of the person, who might actually be ill while entering and gathering supplies for themselves. 6. Mark true emergency supplies differently. I have a rack where I hook packaged Epi-pens, Glucagon kits, Snake Bite Kits etc. My family is very likely to grab emergency supplies and not so likely to go digging looking for some of the obscure things I stock, like the tool to remove rings when there is a hand injury. Another area has cyalume lightsticks, for quick and easy distribution to the family. My next task for the DSR is to install some better lighting. Presently, there are two bright lights in the tall ceiling in the finished room. However in numerous parts of the room, where one might need to read tiny writing while making a selection, there are shadows as the supplies are stacked very high on metal shelving units. 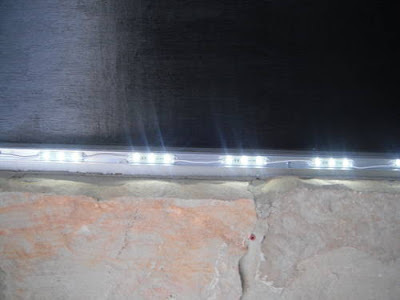 I am thinking that LED lighting in chair rail fashion, around the periphery of the room might be an economical and safe way of lighting all the supplies when needed. Tying up one hand while holding a flashlight while looking for a particular item, has not worked very well. This is an example of the type of LEDs I plan to use in the room. Mine came from Harbor Freight. These can be a big help in lighting up a DSR. Alexander Litvinenko was a former Russian citizen who came to London to live with his wife Marina and three children. He had been a former agent of the KGB and later of the FSB while Vladimir Putin ran both operations. Litvinenko was murdered in 2006. 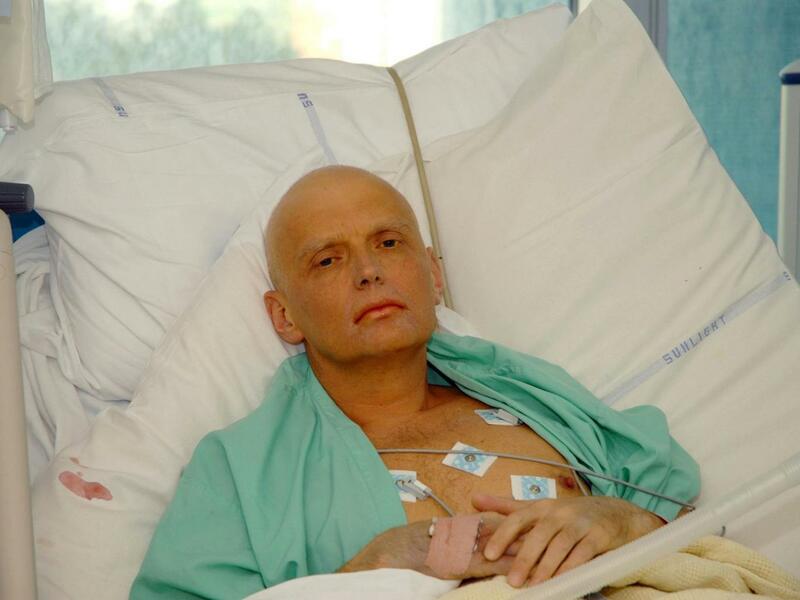 A particularly rare isotope of polonium 210 was added to his tea and resulted in a painful deterioration and death within a British hospital. This not only killed Litvinenko but exposed a number of people during the public transport of the polonium, in the tea room and in days when nurses and physicians cared for the patient when they did not yet know why he was dying. It took a lengthy British inquiry before the results of the investigation was released today. It has long been surmised that Vladimir Putin himself ordered the murder of Litvinenko using this rare isotope which is exclusively available to the Russian military. As the economy worsens or stagnates, the criminals always adapt, often faster than the decent people. Yesterday, I was driving on an interstate highway and a call came in on my cellular phone from a number I did not recognize. I don't answer while driving so they were out of luck. They called again when I got to my destination. The call was a recording in which the IRS claimed that I had been "named in a lawsuit" that was filed today and that I needed to call this number immediately. I didn't think this was very likely. First of all, I owe the IRS nothing, as they already have all my money. Secondly, the caller did not know my name and did not recite it in the message. Thirdly, when I file taxes, I never include a phone number, and I have never provided my cell phone to them. 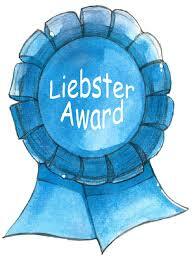 Fourth, if the IRS has a problem with the way my return was prepared, they would call my tax preparer, not me. However, many people might be afraid when they receive such a call. It's a scam, I thought. When I got home and was doing some chores, the same number called again, but I didn't answer fast enough for them, and they didn't leave a message. The fourth time, I was unloading hay in the barn. This time, I answered. It was a recording stating that "IRS Agent Bob Brown needed to speak with me at once regarding the lawsuit that was filed against me today". He repeated the number that had been calling. Although I recognized this as a scam, I wanted more information before reporting it. When I called the number, which was supposedly located in Texas, a man with a heavy East Indian accent answered. His accent was so heavy that I believe he was located in India and that the call is somehow routed to appear as if coming from Texas. When I called, he wanted identifying information. I told him that all I could provide him with is the number he had called. He said he would need a moment to look up my file. When he returned he said, "Ah yes, Mrs. Bourne". Then I said, "No, you have the wrong number. You are not to call this number again." and he hung up. 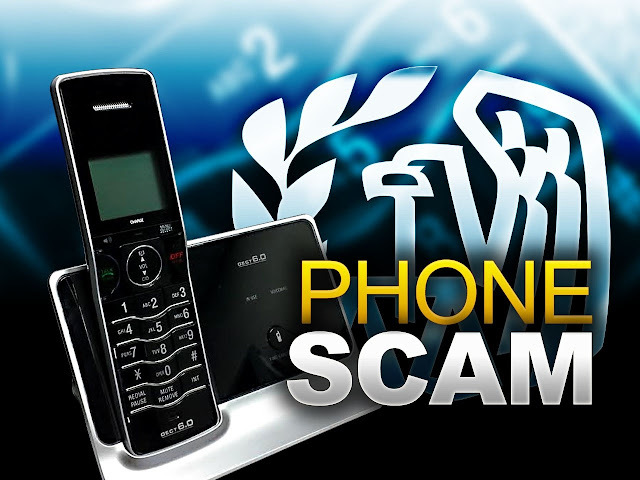 Upon researching this I found that there are an abundant number of telephone IRS scams running out there right now. When you do deal with the IRS, insist that you do so by letter. Don't provide them with phone numbers. If they don't have your number, and someone from there is calling, you automatically know that the caller isn't the IRS, just as I did. This is a reasonably priced prepper home. I try to balance this blog in terms of providing useful and educational health information. I try to introduce useful preparedness information. 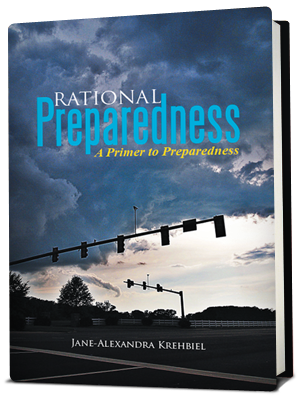 Sometimes, preparedness and the need to prepare gives way to news and political information. I also try to relate something about trends in the world and in American culture. Some time ago I mentioned that a great many "prepper" or survivalist homes have gone up for sale. In a prior series I explored why this is occurring. Some simply age out of their large preparedness home. Others have had a spouse die or become ill and are no longer able to live in a secluded location far from top medical care. Others have completed the original task and have chosen either to move out of the country and replicate their preparedness home, or to build something much larger to meet the needs of their adult children or to include their parents. In any event, a lot of preparedness homes come up for sale periodically. Some are quite expensive, but others provide what you may need including some acreage, at a reasonable price. Periodically, I profile one or two of these. Keep in mind, I am not a realtor. I do not know the owners of these properties. I can't vouch for anything. Do your own due diligence and get any inspections you should. 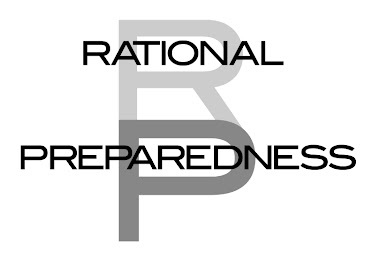 There are many things which recommend Tennessee as a good place to live for preppers. Information between the two sets of undulating lines is the work product of Ed Cawthorne and appeared in Survival Realty.com as of the date of this post. The home below is already living off grid and can be accessed only using a 4 wheel drive vehicle. If this level of seclusion is of interest to you, read further. 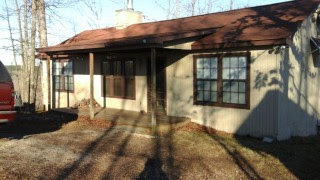 Property is remotely located approximately 30 minutes away from Lobelville, TN in Perry County. Home has 2 bedrooms and 2 full bathrooms. Sleeper sofa increases sleeping capacity to 8. Main bath has stacked washer & dryer. Deep well with good water supply. 20kW gasoline powered generator located in storage building with a 3kW back-up generator. Home is heated with LP non-vented heaters in each room except bathroom. Cathedral ceiling in living room/ kitchen area with exposed beams. There is a 20′ by 20′ deck on rear of house and a large covered porch on front. There are no neighbors nearby and home is located at the end of a dead end road. Property is accessible by 4WD only due to the rough terrain. There are literally thousands of acres for ATV riding. Home is about 1.5 miles from Tennessee River. Kitchen is equipped with an LP range and a full-sized RV refrigerator powered by LP or electricity. I know this will suit someone out there. 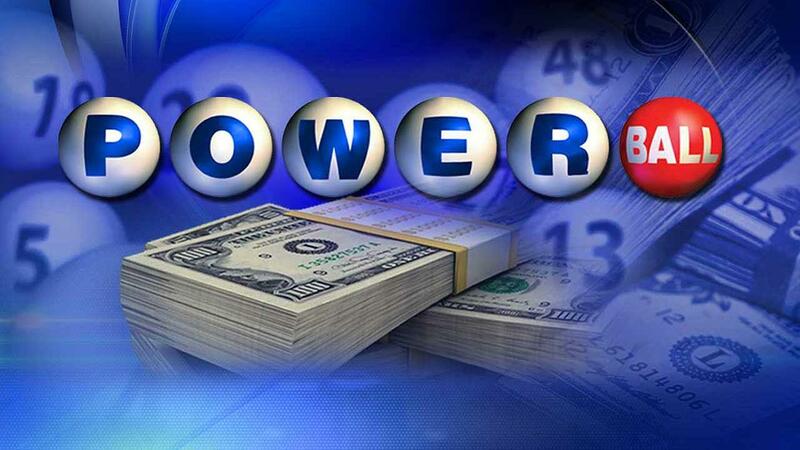 So this week the Powerball Lottery is up to five hundred million dollars. I don't generally play the lottery as having two dollars in certainty, is usually worth more to me than a lottery ticket. My view has also been hardened by scriptural cautions against gambling. 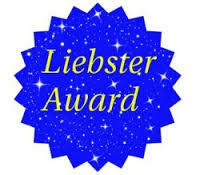 Thirdly, one of my brothers-in-law not so laughingly calls the lottery a "Tax against stupid people, who don't understand what the odds 25 million to one really mean" Despite the slim odds, I do know a couple of people who have won smaller lottery jackpots. One woman won a smaller jackpot a few years ago, and after taxes, was able to pay all her debts, her mortgage in full, fix her car, and allocate funds for the education of her children. She reports to work each day with joy. In her case, the lottery was a lifeline, and I am so glad she won and for the positive changes in her life. This week, when the television announcer said that we were all more likely to be struck by lightning than win this lottery, I gave it more thought. In 2011, one of my adult sons was struck by lightning and has the long term medical issues which go with that. So, we have that type of one in a million luck, albeit usually bad. Besides, I could help my son with some of the winnings, so I broke down and bought one ticket. There is one thing a two dollar lottery ticket does give you. It provides a couple of hours of imagining what such a windfall would do for your family. For some of us, we would change a great deal our lives and for others, we would not, choosing instead to fortify the educations, safety, security and futures of our loved ones. One of my friends, if she won, would buy new cars for everyone in her family since car repairs have taken a big chunk out of the family budget last year. She would move to a place nearer work and install a swimming pool for the hot Virginia Summers. I have different plans. If I were to win, I would change very little about the externals of our lives. I would have the vehicles maintained in perhaps a more timely manner. I would pre-pay some ongoing bills to simply know several months of breathing room. Rather than traveling in to see the vet with so many animals, I would pay the equine vet, the large animal vet and the small animal vet to come out to the farm and take care of my aging animals of all species. They have all been with me for a long time, and they deserve the best care available. I would maintain a few things around the farm a little better than I have been. I'd gravel the farm roads more often. I'd look at solar panels and put in geothermal heat. I'd probably stock more freeze dried emergency food. I'd get a better financial planner, but keep my accountant. Then, I would pay off my children's university debts. I would start a foundation honoring both my father, and start one honoring my youngest son Daniel, who has passed. I would make a sizable donation to the Salvation Army in the name of my mother, who always donated to them because she said they were as frugal as she. I might write more books and worry less about their commercial outlook and more about their positive message or how they aided people reading them. I would be very hands on regarding any charitable activities and scholarships. Then, I would place reasonable amounts in trust for my children and grandchildren......enough to back them up for the future, but enough that they would need to work and not be shielded from the life God sent us all to live. Anyone looking at our lives would still see the frugal family we always were. I would also help some of our friends who have struggled with serious chronic health issues for years. I awoke this morning to find that no one won the five hundred million dollar Powerball Lottery. I got my two dollars worth above in the form of the dreams in the paragraph above and this blog post. Will I buy another one ? No, I think this time I will go with the sure thing, and keep my two dollars. Thank Heaven we still have the living history from Kitty Werthmann and others like her. My parent's friend who also fled Austria is also still very much alive, and living in London. His wife passed a few years ago. 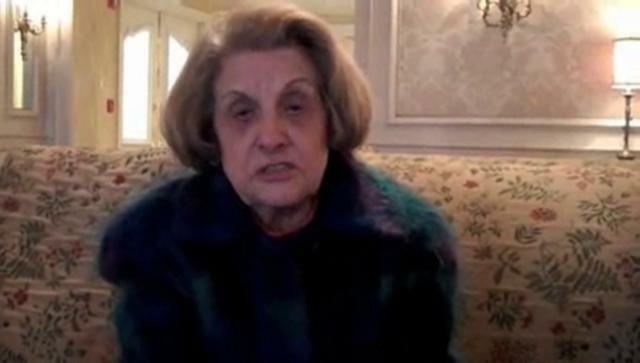 This photo of Ms. Werthmann is a still taken from her video which is on Vimeo. I first wrote this post on January 11, 2013. I am reprising it here because it should be remembered. My parents had friends who lost everything when they fled Austria, and came to England, in the time of Hitler. In these times, it's very important to remember the words of those who were there. Beginning of Kitty Werthmann's testimony, paraphrased. Does this sound familiar ? The US is experiencing a creeping gradualism with the erosion of our freedoms daily. When Glenn Beck says, "Know what you believe", be clear. 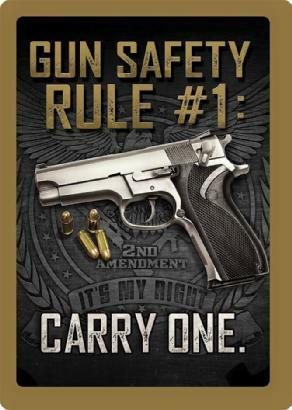 The days of mandatory gun registration or mandatory declaration of what you own may be coming. 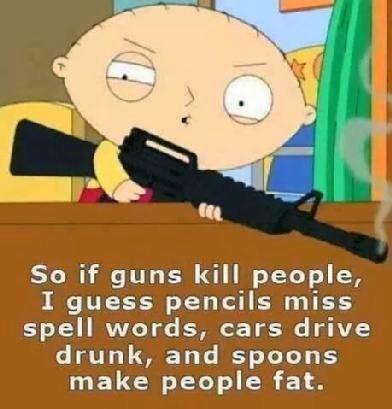 It can be a preface to confiscation. Remember that the Patriot Act already allows confiscation of privately held materials of any kind, if the government declares an emergency. This can be done even without the provision of as much as a receipt to the person, family or company the items were redistributed from. As my parents used to say, "A word to the wise is sufficient". The present US regime has developed a habit over the last six years or so of snubbing the US Constitution, and making up the rules as they go along. The founding fathers called this tyranny. The present regime cannot continue its tyranny without disarming the citizenry, and this is why Mr. Obama via Executive Order wishes to enact some form of gun control this week. There have been warnings for some time that the Federal Government is out of control and is not observing the US Constitution. for background information on the tyranny of which I speak. 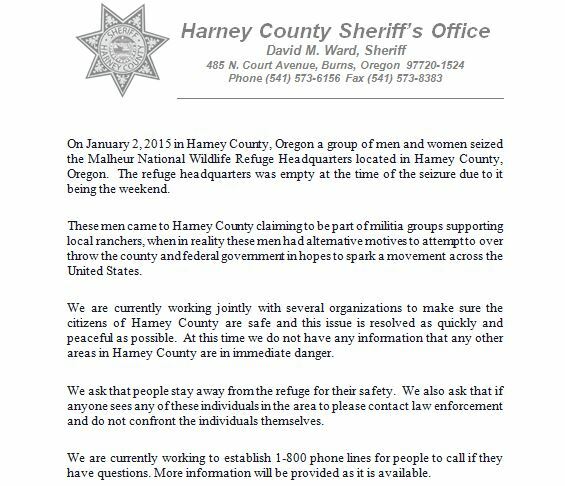 A group consisting of armed militia members, both men and women, are occupying a federally owned Department of Wildife Building, in Oregon. They have a comprehensive laundry list of a number of issues which range from not listening to their views and needs as ranchers, to egregious oversteps and abuse of power on the part of the federal government. Apparently, anyone who does not wish to sell their land to the Federal government when they ask is deemed a terrorist, although the entire matter is much more complex. This was inevitable. A militia group bound by the Laws of the Constitution consisting of a number of former Marines who swore to defend the US Constitution against enemies both foreign and domestic is in direct opposition to the Obama Regime. Please pray for the safety of these patriots and their families. Please read all about this situation. Please decide where you are on this matter. I believe that I would have been in agreement with the local judge who sentences the two ranchers to three months imprisonment, which both served some time ago. I do not support the federal overstep in which the federal government, after the individuals had already served their time, felt that the sentence was insufficient and ordered five years. All over the United States and the world, this regime is making oversteps. They cannot slaughter these men without backlash if the entire world is watching. Remember that (broadly paraphrased) all that is necessary for evil to succeed in the world is if the good people say and do nothing. Please watch this situation closely. I first wrote and posted this actual post on December 20, 2012. Since the weather in much of the US has been quite warm this Winter, and there have been floods which may move spider habitats, I thought this would be a good time to reprise this important post. (Photo: Jim Stone). This is a female black widow spider. 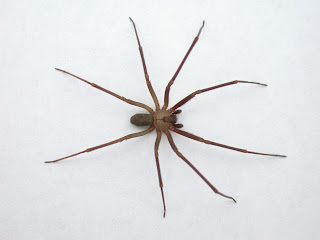 I have written a number of posts which warn readers of the hazards of spiders. Most of us don't expect to be bothered by them in Fall and Winter, even in the South, but then we would be wrong. About eight years ago, while departing from the farm, while driving a minivan, I received a little prick on the back of one of my legs. This turned out to be a brown recluse spider bite, and this was during Winter. Apparently, the spider had made it from the woodpile to the minivan where passive solar heating had made the interior warm enough for it to survive and crawl up my leg, under my slacks as I began to drive. Since it didn't hurt much, and only intensely itched later, I underestimated the seriousness of this bite. It was a few months later when I learned I had a serious hemolytic anemia from this bite, which had long since healed. I eventually recovered, but my critical anemia took a long time to correct, and I did not have a normal energy level for a long time afterward. 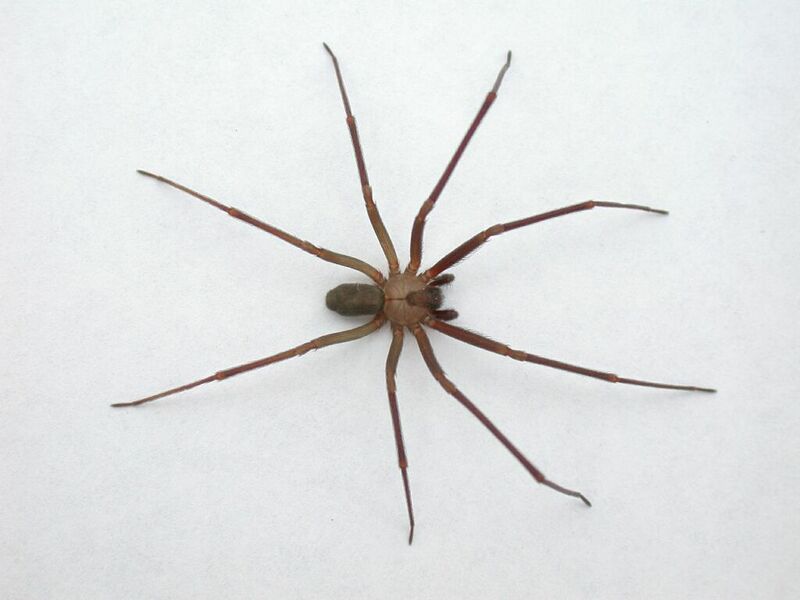 This is a brown recluse spider. Today I was remembering this, as I had a near miss. I have been secretly hiding some gifts in the garage so that my husband and adult kids wouldn't find them. Our detached garage is generally locked and quite secure. When I get the chance, I sneak out there, and wrap and label the gifts, and then hide them somewhere else until "Santa's Night Flight". Despite the cold, I noticed some new webs as I quickly gathered the scissors, tape,. ribbon and rolls of wrap. 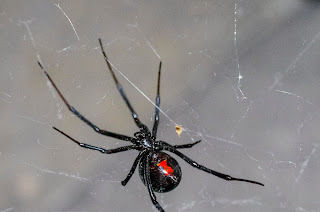 As I neared one of the boxes, I noted the largest female black widow spider I had ever seen. In self defense, I brushed her off the box, and crushed her as quickly as I could. As I did, I remembered the bite I had on my thumb as a child many years ago, and I remembered the terrible swollen tail Rosheen, the Jack Russell terrier had after being bitten by a black widow in her doghouse. There are likely to be more of these in the garage, which is warmer than our woods and woodpile nearby. 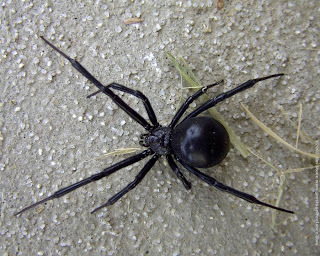 So, even during Winter, as you navigate attics looking for Christmas decorations and wreaths, garages looking for gift hiding places, tool sheds for exterior extension cords, and as you clean out cars of gifts newly bought, please be aware that although we might see fewer spiders in winter, that they are not impossible. When packing away Christmas decorations, use plastic boxes which click shut and stay that way, and use freezer bags which zip shut inside those. Wrapping fragile items in white tissue paper will also allow you to see any hazards before they could sting you. Take care, even in gloves or boots. Our Californian habit of shaking our shoes and gloves before putting them on, is wise, in any place. 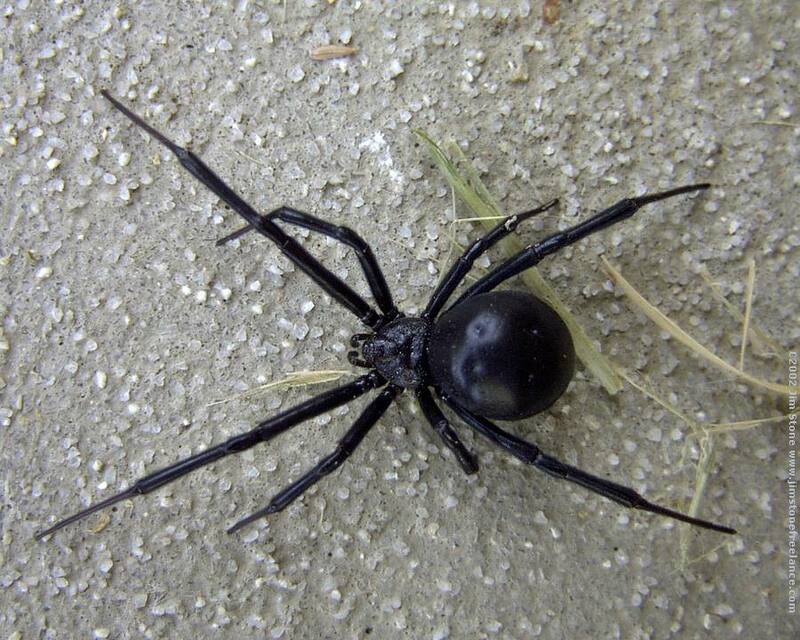 This is the underside of a black widow spider. The hourglass is characteristic, but some simply have other red markings.